Hi, my name is Leah Paras and I'm a trainer and consultant with Corporate Education Group. Once the project management plan is complete, many project managers may feel even more overwhelmed than before the process began. Don't worry, this is a normal reaction. Let's face it — a project management plan is an overwhelming document and even the best project managers are often left wondering, "How can I possibly ensure all of these components are executed successfully and on time?" 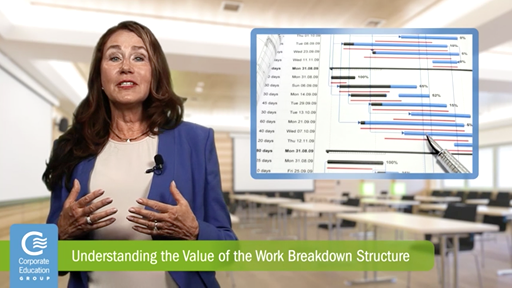 Because a project management plan has so many variables, many of which exist on similar timelines, creating a Work Breakdown Structure — also known as a WBS — is the light at the end of the project tunnel. To create the WBS, project deliverables and project work are subdivided into smaller, more manageable components. To put it simply, the WBS provides a structured version of everything that has to be delivered. The WBS should be considered the backbone of the project management plan since it includes all the work and only the work to be performed. A strong and all-encompassing WBS creates a hierarchical view, organizing the scope elements in such a way as to illustrate their relationships clearly for the benefit of anyone interested in the project. The WBS has an established order, rather than a random list of deliverables to manage. Furthermore, the WBS serves as a graphic to help stakeholders visualize the complete breadth of scope. deciding what procurement support is needed. The WBS continues to play a pivotal role during actual project execution, providing a logical framework for monitoring, controlling, and reporting on progress. There really is no "right" or "wrong" way to structure the WBS. Choose a format that works best for your project. Review your company's existing policies, procedures and WBS templates to help streamline its development. Also, take a look at project files and lessons learned from previous projects to help avoid re-inventing the wheel. Remember, one of the most important success factors is a clear understanding of a project's objectives and deliverables. That understanding is enhanced with the project's work breakdown structure.